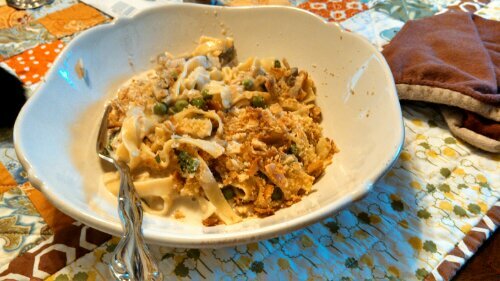 I know we shouldn’t like tuna noodle casserole as much as we do, but there it is. It’s delicious. This recipe isn’t necessarily super fast because it takes a while for things to brown, but it is tasty and doesn’t use a lot of dishes. Which means it wins a weeknight possibility award in my kitchen. We found it…The Best 30-minute Recipe from America’s Test Kitchen, but this recipe is almost identical. We made it…We always do this dance about which tuna is cheaper/will provide us with all that we need for the recipe, and this time we went with the large can instead of the bags. It was less tuna than called for, but was fine. Though I wouldn’t have protested more. We also just used a half pound of mushrooms since the package was on sale. Other than that, the recipe was followed as is. We thought…We’ve made this before. It’s sort of a fancier version of Tuna Helper, and we like it. Again, probably more than we should.